When you get an idea for an ink project you reach to grab a pen. But you want something that works well for art and something that fits your needs. A pen is more than a tool. It’s a method of transferring your ideas from your heads onto paper. Finding the right pen for the task at hand is crucial. This article will look at the best pens you should consider adding to your art supplies. All of these have various pen tips, inking styles, and grips, among many other features so there’s a lot to consider. 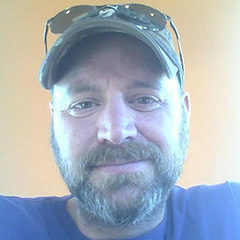 But I’ll help you find the best match for your artistic style. This pen set by Sakura is everything you’re looking for. The pack comes with 6 different sized nibs ranging from .20mm to .50mm(in 0.05mm increments). The ink is acid-free, bleed-free, and won’t feather. The pens are perfect for all drawing and writing paper too. There are so many different aspects to an art pen so it really depends on what the pen will be used for and the type of drawing you do. Sketching will be easier with smaller nibs and fine lines with occasional skips, where artistic drawing can use a wider range of tips, angles, and mark thicknesses. In almost all cases the type of ink will matter a great deal. Ballpoint, fountain or roller ball, the tips supply the ink from the cartridge to the paper. That ink, if not correct for the paper type, can smear, bleed through, smudge or even corrode. Acid-free ink is important and so is the ability to control the flow. Style and comfort are also very important. A pen is a tool, yes, but it is also an extension of yourself when drawing. You’ll want to feel the weight of the pen but not be encumbered by it. Keep this in mind since it’s not really a big deal, but everyone’s preferences are different. A pen might feel great in my hand but too heavy in yours. You may have to try out a few different styles to find the perfect pen. And you might even develop a collection of art pens for different purposes. You may prefer broader strokes and a harder nib, or a softer nib with thinner strokes. It all depends on what you use the pen for on a regular basis. If you want to see how different pens work you can watch this detailed video on the features of pens and how they’re used by artists. The same pen that works for a sketch artist won’t work for the inking illustrator. All I can say with certainty is that when you find the right pen you will know it. Hopefully my guide will point you in the right direction and help you draw the right conclusions to get buying! Puns fully intended. The Pigma ink is highly sought after and used by thousands of artists and writers every day. While the style is less than classy, the thin barrel of the pen is very easy to hold. The fine point nibs come in various sizes that allow for fine point strokes without compromising the flow of ink or having to twist the angle. Once you use this pen in your sketchbook you will understand why the Sakura Microns are a go-to pen set for many artists, both amateur and professional alike. The ink doesn’t bleed through on anything. Although if you do have really thin paper(like tracing paper) it can be tricky to keep lines from smudging. Generally though I’d guarantee this ink won’t feather, spread, or skip. The Sakura Pigma Microns are perfect for sketching too. The minimal skips in ink flow are hardly noticeable and actually aid in sketching when they do occur. When line drawing or lettering, the ink stays put on the page and will dry almost instantly, allowing you to brush it with your palm and keep on drawing. 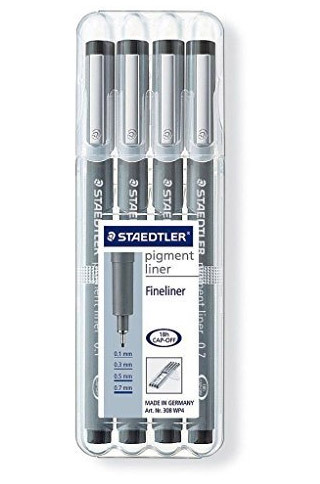 The German company Staedtler makes these liner pigment pens that come in a hard case for support and protection. That’s not what makes these pens so great though. It’s because the ink is nearly flawless. When you make a line you will get a true black ink that doesn’t bleed through paper and can quickly be drawn over time and again. The steel nibs protect the soft tip which is designed to allow free-flowing ink without you needing to press or rest the nib down. Stencil artists and straight edge writers will benefit from the liner pens as each one will provide a clean, constant line with virtually no skipping. You may need to allow the ink to refill at the tip from time to time. This can happen with plastic cartridges but it’s no big deal. Please note you should not store these pens cap side down as it can cause the tips to dry out quickly. However, with proper usage, you can achieve clean and crisp lines without smudging on almost all paper types. 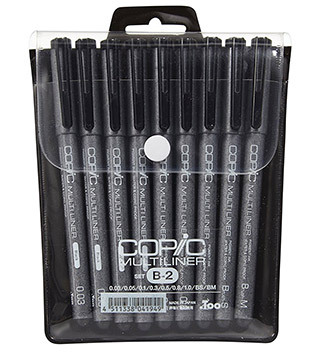 Fans of multicultural art pens will love these Copic Multiliners. Not only are the pens waterproof but they are Copic marker proof as well. This means once the ink dries you can go over the lines with a Copic marker and the color won’t bleed through at all. The ink does take a bit of time to dry compared to other entrants on this list. However you get nine different widths including two brush stroke tips(Brush M and Brush S) for perfect lines when drawing anime, landscapes, characters, or even fashion design art. The color blends are near perfect and will actually blend on the paper, not in it. This means for multi-colored drawings you won’t have your paper wilt or leave wet marks as the ink dries. Perfect for mixed media work. 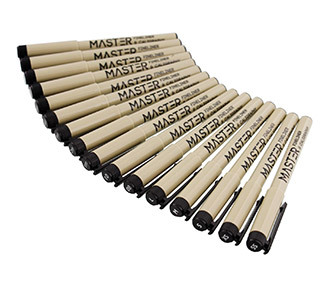 This micro-pen set from Master is one of the most reliable pen sets for all artistic work. It doesn’t matter if you sketch, write, storyboard, animate, or need professional lines like in architecture work—these pens will do it all. The pigment ink doesn’t bleed in my experience. Every mark feels very sturdy. You can achieve ultra-fine lines and brush strokes with the 16-piece set covering absolutely everything you’d need. All nib sizes from 0.15mm up to 3mm are included as well as three calligraphy and chisel tips. Shading, line work, lettering, and ruler work will all benefit from the dark ink and strong steel nibs in these pens. The cartridges, though, are gravity based and will refill the tip as needed. You should never store these pens cap side down or they can explode inside the cap. It’s not a literal explosion so it’s not dangerous! But it will make a large mess the next time you uncap that pen. The ink dries at an average rate but should be checked prior to going over it with another color or line size. If the ink is still wet, it can bleed through the new color. For the watercolor artists and brush stencil creators, the Tombow Dual Brush pens are a practical choice. 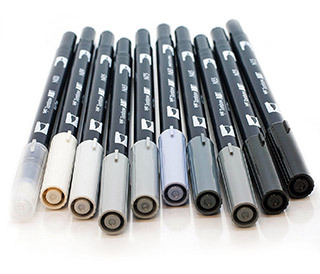 These reliable pens come in a grayscale color for a true black and white drawing range. There is also a colorless pen for blending and smudging. 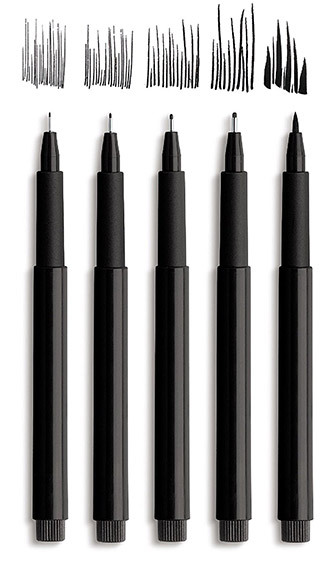 The tips of the brushes self-clean after you blend colors and the steel nibs of the pen tips create a soft ink flow for solid, continuous line work. 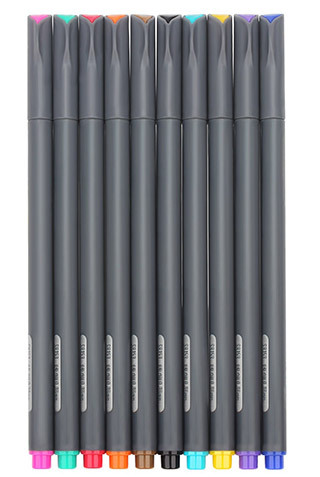 Each pen is dual sided with a brush tip and a pen tip in ten varying degrees of gray. You can create watercolor effects, faux calligraphy, or landscape works with full shading and light without ever using another pen set. Really nice for anyone who’s interested in the dual brush style. 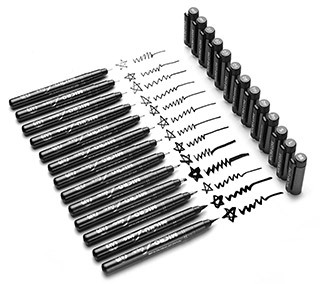 Technical artists and comic artists will truly enjoy the Pandafly Fineliner pens. This set has 13 pens with a vast array of tip sizes and styles. All of the ink is pigment based so the color stays true and rich. Lines are solid and even if using stencils they won’t skip or bleed. All of the Pandafly pens are acid-free and can be used on any paper from really thin to super thick. I’ve used them in mid-sized sketchbooks with no problem. Only worry is if you rest the tip a moment on the page. This can cause a bit of bleed-through but it’ll take some thin paper to really leave a mark! The weight of the pens is well balanced which is something most of the other makers don’t have. The majority of other markers either fall on the lighter side or heavier side. Pandafly does it right with their set and I think every artist would appreciate their weight. Drawing and writing for extended periods don’t cause hand fatigue; in fact these make you wanna just keep going for hours! If you need more color in your life (and who doesn’t?) the Huhuhero pen set could be a perfect fit. Not only do you get 18 of the brightest, fastest drying marker pens, you also get a quality ink that doesn’t fade or run. The ink dries extremely fast and lines can be drawn over with other pens without worrying about mixing tips. The metal-clad nibs provide support so line drawers, as well as sketchers, can press harder without damaging the .38mm tips. Stencil and letter artists will get the most benefit from this set. The array of colors offer a vibrant pop that also fits with cartoonists and illustrators too. But this set is definitely geared towards the finishing touches in a piece of work, not the early stages or any inking stage. If you need a budget-friendly pen set that will do you justice on the page, the Faber-Castell Pitt pens should give you quality without breaking the bank. Inexpensive is the key as these pens are definitely affordable by anyone. The archival pigment ink is long lasting, fade resistant and waterproof. But it will take a little while to dry so keep that in mind. The cost savings come in the nibs, tips, and cartridges which are even cheaper than most. The ink runs out fairly quick compared to the other options on this list. However it won’t cost you much to replace. If you use stencils or rulers the ink can feather slightly, but this can be avoided by making slightly faster strokes. If you already do this as an artist you’re good to go. For line drawing, comics, or lettering, these pens work near flawlessly. There is a slight stutter in longer lines but going back over can fix the problem. The nibs don’t leave too much extra so you won’t increase the line width by running over your lines one extra time. So hopefully this guide has helped you find a few brands you really like! Ultimately you have to decide the nib style you’re after as well as the tip type. Metal-clad nibs are more sturdy that steel nibs but put more pressure on the tips. You will also need to consider the ink quality and depending on your primary usage; you may need darker blacks than some pens provide. Our top pick considering everything you get is the Sakura Pigma Microns. The steel nibs and nylon tips hold enough ink to leave dark marks and rarely ever smear or smudge. 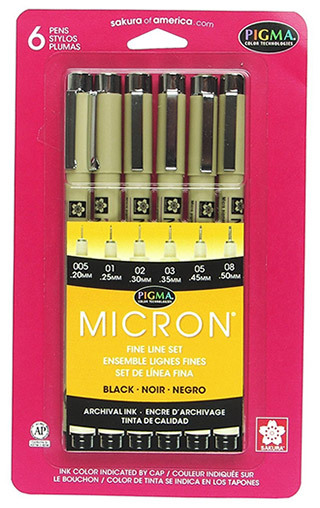 The Microns are well balanced and offer something for every artist regardless of style. You’ll also find that the comfort of the barrel is unmatched. These would be perfect for everyone from comic artists to illustrators, or just general artists who want to do more work with ink.